Question to Radhanath Swami: Why is it stressed so much that we understand God from a bonafide Guru? Can’t we resort to scientific research, like we do to understand any other phenomena? Radhanath Swami: Our Guru Srila Prabhupada, in his purity of heart and humility, again and again stressed, “I am simply repeating the words of my Gurudeva and Sri Guru Parampara.” This is the descending process of acquiring knowledge. 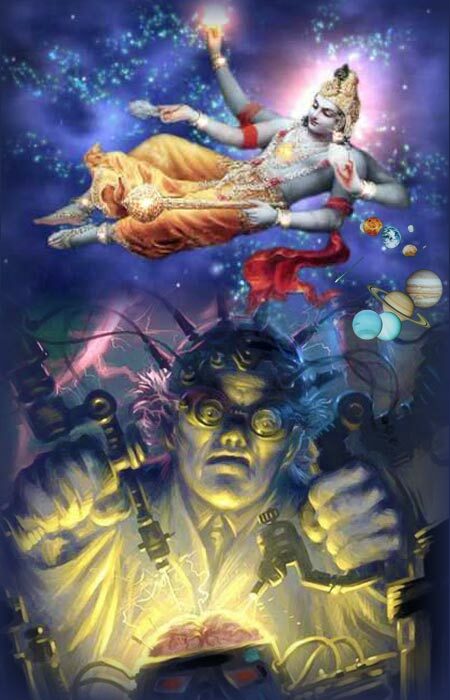 Prabhupada stressed this especially because at this particular time within the age of kali, the ascending way of approaching knowledge has become very much prevalent. In fact, modern scientific education especially trains people to doubt authority, to independently research to find out what is truth. Now according to God Himself, through the process of ascending knowledge—even with the help of the Holy Scriptures—we can at the most attain an understanding and realization of the impersonal Brahman, and perhaps Paramatma. But Bhagavan realization, realization of the personality of Godhead, is utterly impossible through the ascending process. It is only by the mercy of the Lord that we can understand him as he is. So therefore Srila Prabhupada, who didn’t give the generic idea of ‘God’ consciousness, wanted to stress this point. He was giving ‘Krishna’ consciousness. ‘Krishna’ is Bhagavan. ‘Krishna’ has all 6 opulences in full for all of eternity. As far as ‘God’, ‘God’ could mean the impersonal Brahman to some, ‘God’ could mean a demigod to some, or ‘God’ could mean the Paramatma within the heart to others. But they are all partial understandings of Bhagavan. The only way to approach Lord Krishna, Lord Krishna declares himself in the Bhagavad Gita, “It is only by undivided, unconditional devotional service that I can be understood as I am.” Prabhupada’s special contribution to the world is that he spread throughout all the continents of this planet the full complete understanding of the Absolute Truth, Krishna, who is the supreme enjoyer, and how to reach him—through unmotivated, uninterrupted loving service. When Krishna is pleased by our service, Krishna reveals Himself to us.